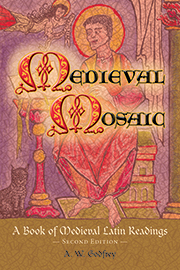 These informative and entertaining selections build a brilliant mosaic that depicts the thought, theology, history, and spiritual lives of an array of people living in the fourth through fifteenth centuries C.E., from early Christianity to the Renaissance. The passages, complete with notes, are accessible to intermediate Latin students and include a fine range of well-known and less often included readings. Eighty-four selections—from Tertullian, the Nicene Creed, Augustine, Boethius, Isidore of Seville, the Cambridge Songs, Abelard and Heloise, Hildegarde of Bingen, Francis of Assisi, Giovanni Boccaccio, Jacopo Sannazaro, and others—introduce students to a broad range of genres, topics, and styles. The second edition includes 41 new illustrations and seven new passages. The new passages include The Passion of the Saints Perpetua and Felicity, Proba, Ausonius, Claudian, Elpis, Agnes of Assisi, and Constance of Hungary.